Almost three months after my college started, there came an opportunity to take a week long "vacation". A short visit to Bangalore and Mumbai was on cards. The decision came at the last moment, and ticketing was a problem. We booked on the Kochuveli-Yeshwantpur Garib Rath from Ernakulam to Yeshwantpur. As luck always favours, we (I, and my parents) were given all upper berths. The train had some 580-odd berths still available, when the PRS decided to play a game. Later, we decided to exchange berths once on board the train. We started from our hometown (Kodungallur) on Friday night. It was raining heavily during the day, and decided to hire a taxi instead of traveling by bus. The cab - a white colour Ambassador - came home by around 10 at night. The driver maintained a sedate 60kmph all the way to Ernakulam Town Railway Station - taking about an hour to cover the 35 km journey. The station was all buzz with activity - cleaning works were on at a very mad pace - thanks to an expected visit by the Minister of State for Railways the next day. The platforms were crowded, with lots of passengers waiting the next few departures. The Mangalore-Trivandrum express came in at around 2345, with WAP4 #22793 in charge. 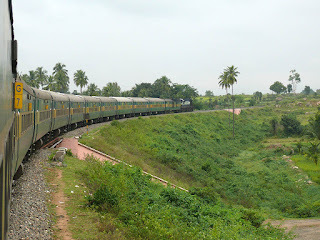 Later, the Trivandrum-Mangalore Maveli Express rolled through the main line without stopping. The Mangalore bound Malabar express came in at around 0015 with WAP4 #22792 in charge. Loads of bags containing post were loaded on to the RMS coach during the time the train stopped there (and an equal number were unloaded as well). There was no sign of my train arriving, even as the clock ticked past the departure time. An announcement was made at around 0030 about the arrival of my train. The train arrived at around 0044 behind WDG3A #13049 of Krishnarajapuram. I was clearly disappointed about having a WDG3A given the tight schedule we have. We started from ERN at 0054. The train picked speed pretty quickly. The train appeared pretty crowded that night. There was just one lower berth vacant in the entire coach. We sat on the berth till the TTE turned up. An Information Display system was installed inside the coach, and it appeared to be working as well. The display was constantly showing messages like the speed of the train, time to the next station, distance to the next station, etc. We stopped at Aluva at around 0113, and left at 0115. Just two passengers were seen on the platform when the train reached there - the train was already full then, underlining the fact that most passengers board the train before ERN. The TTE turned up at around 0145. He quickly allotted us Berth 1, 2 and 9, instead of #9, 12, 14 as per our tickets. Berth #1 was a lower berth. We quickly locked up the baggage and headed to the berth. I slept the moment I got on to the berth (I took #2, a middle berth). I got up well past 7 AM. We reached Salem at around 0737, delayed by about 45 minutes now. We left Salem at 0742, almost 50 minutes late now. The LP appeared to be at no rush to reach Bangalore, and the train accelerated at a sedate pace. I chose to remain indoors, since I had symptoms of developing fever (partially due to lack of adequate sleep, and the sudden change in climate - from hot and humid to chill and dry). The terrain between Salem and Bangalore is always my favorite - with grades, twists and sharp curves all the way. The loco did a good job in this section. We had a non-stop run from Salem to Dharmapuri. The Halt at Dharmapuri was added only very recently. The train reached Dharmapuri at 0900, and left at 0902. We crossed the 2677 Ernakulam Intercity here - WDM3D #11111 of Erode was in charge. The caterers on board the Garib Rath, are under the same management as that of 2677 - both trains are served by Our Aariya Caterers. WE made an unscheduled halt at Rayakkottai, to cross the Bangalore-Salem passenger. The passenger came in after almost 15 minutes of us waiting there - behind WDM2 #17603 of Krishnarajapuram. It was an uneventful run after Rayakkotai. I chose to remain inside the coach, watching a movie on my laptop computer. We ran through Hosur at a low speed. I called up my brother, who was to pick us from the station, to inform him of our whereabouts. We reached Banaswadi at 1120 - where we alighted. The station's signals are powered by a diesel generator - which was making a very annoying "Phut-Phut" sound. The generator was shut down about 5 minutes after the GR headed to Yeshwantpur. My brother lost his way to the station somewhere, and he landed up there well past 1230. The return journey from Station to home was even more interesting with us landing up at alien territory many times - only to vow that we'd never ever get down at Banaswadi. I always enjoy your blog and this GAribradh Yathra was nothing less. By the way, were you fasting on your journey (since you mentioned on other train's catering).!!! I just missed out mentioning about the Breakfast part - the catering guys load all the wares from Erode. Tea wasn't available through the journey - but coffee was available. Options for Breakfast were Idli-Vada, Poori Masala and Dosa. Since we were three, we bought one each of the three, and every item was delicious. Lovely report and equally enchanting photographs. It was quite a pleasant surprise to meet you in Bangalore the day after, and even more of a surprise that you had arrived by this train (given its inconvenient departure fro ERN)! But then you were constrained by lack of bookings, and I presume your parents are not comfortable with travelling by bus. Interestingly, the huge avaiability for this train even at the last minute, in contrast to the return train which fills up much faster, shows that there is quite some scope for changing the slot of this train in order to gain more patronage. I guess most of the crowd that night were similar last-resort travellers like yourself. The only plus point, from a railfan's perspective, would be the scenic run between SA-DPJ in the morning hours. Also, you mentioned the information display - did the train maintain good speeds? What was the patronage at Dharmapuri? Did a large number of people alight? PS: I really miss the ratings you used to give trains on various parameters when you used to post travelogues on your website!